High-performance buildings save billions of dollars annually, make operations more efficient, contribute to the health and well-being of occupants, and create long-lasting value.The Landlord-Tenant Energy Partnership makes it easy. The Landlord-Tenant Energy Partnership gives anyone tasked with tackling energy and sustainability challenges in commercial buildings a foundation to deploy win-win solutions that make energy efficiency easy and productive. 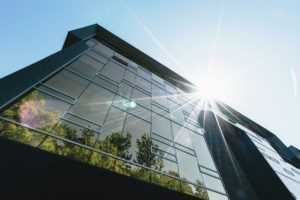 Energy efficiency is about more than just cost savings. Investment in efficiency yields a broad payback for both landlords and tenants that spans from greater performance and productivity to improved stakeholder relationships and brand reputation. However, IMT’s expertise working with landlords and tenants across North America reveals that existing business models applying low-and no-cost strategies and technologies needed to unleash efficiency are used sparingly due to legacy business practices. The Landlord-Tenant Energy Partnership helps businesses overcome this barrier and generate results. Start Saving NOW. Get started by taking the Landlord-Tenant Energy Assessment and receive a customized dashboard of the biggest energy-saving opportunities you can begin exploring today. Contact Us to Access the Landlord-Tenant Energy Partnership Efficiency Toolkit: Whether you are just getting started or are looking to adopt a more sophisticated approach to achieve deeper energy savings, the toolkit has something for every real estate or sustainability professional. Send us an email at energypartnership@imt.org to request access to the toolkit. Become a Partnership participant.Want to know what it means to be an official partner of the Landlord-Tenant Energy Partnership? What is needed to align priorities between landlord and tenants? Read key challenges, opportunities, and trends identified at LTEP’s 2018 retail energy & sustainability summits. Want to know more about becoming a strategic ally or sponsor of the Landlord-Tenant Energy Partnership?